Quite cool web comic project on Jugger, with excellent drawings of the teams Wild Geese and Drop Bears, is offered by Schwartz and merc. There is also a comic story ongoing. Gravatar, Pavatar, Favatar, MyBlogLog, Pavatar author images supported. 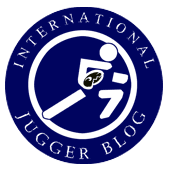 ... in 2006 10 teams, but in 2008 31 and in 2012 61 teams competed in the German Championships in Jugger? ... the spelling "Qwik" had ben defined by the screenwriter in the ending credits of the movie?